If you haven’t yet, read Part 1 of this series by guest blogger Joanne. Joanne invited her friend Karen to share her recent “gray area” euthanasia story on our blog. Hunky Hanoverian appreciates Karen’s willingness to speak about her experience! Tell our readers about your history with Flame. I purchased Flame (Flaming Mata Hari) in 2006 from a breeder in CO that was going out of business. 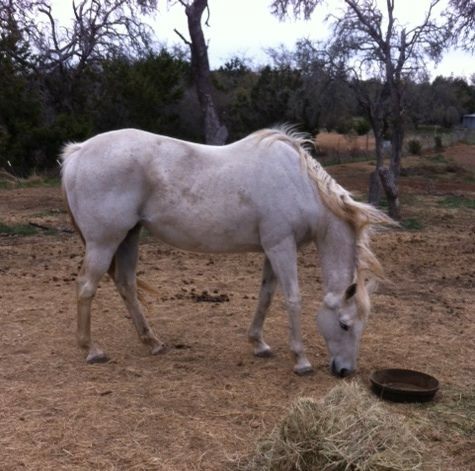 I purchased several horses from her and Flame was not one of the top ones I was considering. At the time I didn’t have experience with a one-eyed horse; the breeder told me she didn’t like live cover so had to be AI; and for that reason (the breeder had their own stud), she was not pregnant, and it was too late in the season for me to take on her breeding. However, this breeder said she had to sell the horses due to family health reasons, and there was someone else looking at Flame who gave her an uneasy feeling … so she offered to AI her, check her at 30 days, and then put her on the truck with the others, for a pretty nominal price (I think it was $500). I agreed. I never regretted it. She gave birth to a beautiful foal in July 2007, I still have that mare and she is in training to be my equitation horse. Flame came with a few other TB mares, all off the same track in AZ. One in particular, Linger Lea, was her best friend. 4 years ago, during my divorce, I was given an opportunity to breed both Flame and Linger Lea in exchange for one of my other nicer broodmares. I was ordered by the court to keep the tax exemption in place until the farm sold as part of the divorce proceedings, and breeding was the only way I could do it. And sent both since they were friends, and I wasn’t sure both would take. I sent the mares off to be bred by the stud owner, I didn’t know her but was referred by a good friend I trusted. It was live cover. Surprisingly, Flame took right away, but Linger Lea did not, so they stayed until the next cycle. A few weeks later I got a call telling me that Linger Lea had died. It was very suspicious … the breeder said she was fine that morning when she fed, and then by 2:00 that afternoon she found her body. I called a renderer to go pick her up, and he called me the next day and said she’d been dead for at least 3 days, if not longer. I scrambled to immediately go pick up Flame. She was in very poor condition and looked extremely traumatized. She loaded up fine, but it took me and another person over an hour to get her OFF the trailer. At this point I wasn’t worried about whether she had absorbed the embryo — I was just trying to nurse her back to both physical and mental health. (She did end up losing the baby). I don’t think she ever fully recovered mentally from that experience. I never tried to breed her again. What factors did you consider when deciding on euthanasia? Age was one factor but she was in relatively good health for a 22-year old TB. She arrived with several large melanomas in her neck and along her jaw. I had them biopsied shortly after I got her and they came back benign, but the vet did warn me that it was likely she had some internally — and that could potentially cause problems if I ever bred her again. I had him examine her mouth to see if the tumors on her head/neck were interfering with her eating, because she’d hold her head in an awkward way to eat — but she was holding her weight fine at that time. He said he couldn’t see anything that was causing her problems yet but they might in the future. After her friend Linger Lea died, there was only one horse, a gelding, that she was comfortable being with. If she lost sight of him she would panic. I thought it would get better with time but it only got worse. Fortunately he was also a pasture pet so didn’t have to be taken out frequently, but it was still a stressful situation if he went off on his own. Physically she began to get serious arthritis in her pelvis and hind legs. I used to sedate her to trim her hind feet, but about 3 years ago, the farrier couldn’t even lift them with her sedated. So for the past few years we’ve only trimmed her front feet. She also began losing weight. Not bad, but she was never a hard keeper — not easy, just not hard. Unfortunately the gelding she was with in the pasture was a very easy keeper and also dominant, so I had to set out 3 dishes for when he finished and ran her off. She had to be pastured 24/7 or she cribbed terribly and go off feed, I’m pretty sure she had ulcers flaring up when stalled. Those were all inconveniences but not one, or even two, would have made my decision without the panic. There was no calming her when she got afraid — not after her pasturemate died. She would run over people and even through fences when she got scared — and it could be being chased by a bot fly, being put in a new pasture (even one adjacent to her), losing sight of her gelding or her donkey etc. She just seemed to live in a constant state of fear unless everything stayed exactly the same. Were you concerned about backlash from other equestrians? No. I contacted her previous owner prior to the appt. to let her know I was going to, and as far as I was concerned, her opinion was the only one I cared about — and I was pretty sure she would be supportive (she was). I did have some concern that the vet, who had never seen her before, might come out and say she looked too healthy and question the decision, but that didn’t happen … the large melanomas and their placement could have been one reason why, they had grown slightly over the years and were pretty impressive. (The vet is a partner of my riding instructor). What part did your vet play in your decision? What means of disposal did you decide on, and how did you make that decision? Because we have dogs and no way to bury the body deep enough, we use a renderer. I’m not crazy about it, and don’t watch the pickup if I don’t have to, but practically, we have too many horses to bury them all on our property even if we could. There would only be a few that I would consider doing that with. We do cut off the tails and keep them. If any readers are inclined to do so, where woud you like memorial donations made in Flame’s name? A TB rescue organization such as Canter TX or Remember Me Rescue. One other note: Between the decision and the appointment, I still let questions go through my mind as to whether it was the right thing to do, but every time I did, she’d have another panic or almost run me or my husband over. During our discussion he actually said, “She’s the only horse we have that I am genuinely worried about when I go into her pasture, because when something scares her she just loses or mind.” And she wasn’t a “naughty” horse. When she was calm she was friendly, affectionate, easy to catch, loved being groomed, etc. She was a very sweet horse — which is what made her frequent injuries and panics even more sad for us — we just knew it would only be a matter of time before she hurt herself in a traumatic way and we didn’t want that for her. BUT … I wasn’t prepared for the fight against the euthanizing drugs. She was sedated, the drug was given, and she went down … but she didn’t pass as quickly as any other horse I’ve had to euth. I’m not sure why. Maybe she was more healthy than other horses I had put down. Maybe it was the strength and combination this vet used, since I’d never used her before. Flame kept breathing a lot longer than I was used to, and then even when the vet couldn’t hear a heartbeat she was still getting a reaction from her when she held a finger against her eye. Not going to lie, that bothered me. Was she fighting for her life? And if she was, did I really do the right thing? But I didn’t dwell on it because at that point, there was nothing I could do about it. I do encourage readers to consider discussing this with their vets prior to euthanasia. But now that it’s over, I miss her, but don’t regret doing it. I used to worry about her every day. I’d wake up in the morning wondering if she had hurt herself during the night. So I probably selfishly did it for my own peace of mind, as well. Always a tough decision to make, but sometimes it is the most humane one even if we question ourselves about it. Couldn’t agree more about it often being the humane option.